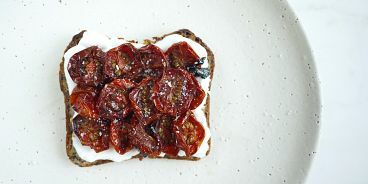 Unless tomatoes are super-sweet or marinated, I can’t say I am a die-hard fan. But roasted? I can’t get enough. I could eat tray upon tray. Prepared this way, they truly can satisfy ‘sweet cravings’ – they are like candy! For breakfast, I enjoy piled on crispy toast with a layer of egg-less mayonnaise. Preheat oven to 300F. 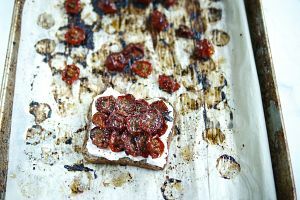 Slice grape tomatoes in half and spread out on a parchment lined baking sheet. Drizzle with olive oil and s&p, then toss with your hands to coat. Roast for around 2 – 3 hours, or until they’ve reached your desired ‘dry / crispiness’. The longer you roast, the sweeter they get. 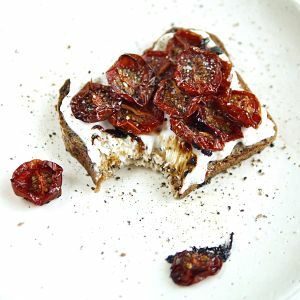 Once fully roasted, pile onto vegan mayonnaise lathered toast and sprinkle with fleur de sel and fresh pepper.